Just a few words to say thank you to everybody who has made Shedworking such a pleasure to put together again this year, not only at this main site, but also at reddit, twitter, Facebook, pledgie, Blip.fm, and brightkite (and not forgetting Bookshelf). Particular thanks as always to that marvellous promoter of shedlife Uncle Wilco from Shedblog and readersheds.co.uk, and to our literary editor Sarah Salway and garden shows editor Emma Townshend. Large thanks too to all those of you who have added comments to keep the shedworking conversation going or emailed me with suggestions for the site including Elspeth Thompson, Annie Leymarie, James Alexander-Sinclair, The Garden Monkey, Jay Nigrelli, Patricia Debney, Tim Baber, Alan Bucknam, Lloyd Alter, Justin, Greg, Bill Kratz, Suw, Nikki Spencer, Ben Locker, Chris Routledge, Juliet Doyle, and Bill Dockery. Large thanks to the many other supporters of shedworking and homeworking in general for companionship, ideas and general fun: the list is too long to include everybody but special mentions for Emma and San, Grant, and Jeff plus Steve Cowell for help with The Shed. And last but not least, many thanks to the advertisers who have helped to keep the site going in 2008 with their generous ongoing support. It's pretty wintry in the environs of Shedworking HQ so I thought we'd finish the year on a suitably chilly note with this splendid shedlike atmosphere, ideal for any garden office worker, Igloo by French designer Charles Kalpakian who trades under the hellokarl name. There is plenty of interest eleswhere on his site for shedworkers too including his 'modulo' and 'Vitra' below. 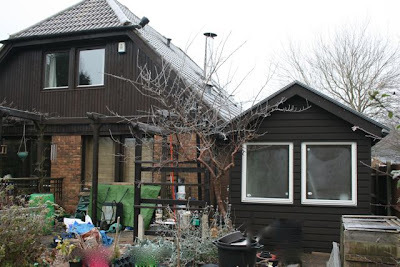 "The UPVC double glazed frames and Light Oak Pillars mean you can concentrate on what you do in your Garden Room, rather than worrying about what the British weather is doing to your asset." The model is also available with a rent option. "There are hooks for clothing and towels, and a built-in shelf unit, made from a pallet, for storage of food, books and other items. A rubber flap over the entrance provides privacy, and one end of the structure is made from translucent polyurethane to let in natural light. 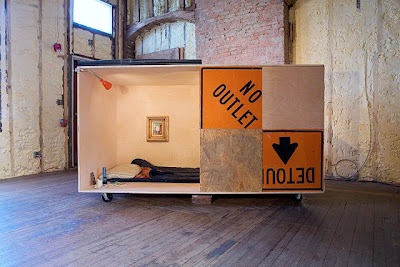 Homeless Chateau is fabricated from standard 4 x 8 and 4 x 4-foot sheets of plywood, OSB and construction signs, and can be knocked down, transported flat, and erected quickly and easily with just a screwdriver. Once assembled, the structure can be moved around the host space on its casters and then set in place with a temporary foundation - two bricks under the front. Homeless Chateaux can be easily reconfigured and combined to make dual-occupancy and eight-foot-tall structures." 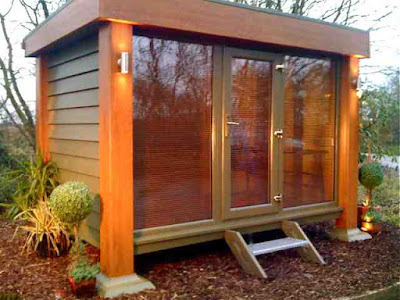 The latest shed supplier to start blogging is Walton Garden Buildings which you can read here. 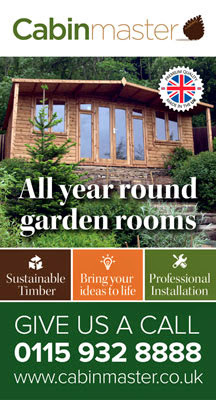 Posts so far on how to move your shed and whether a log cabin makes a good garden office. 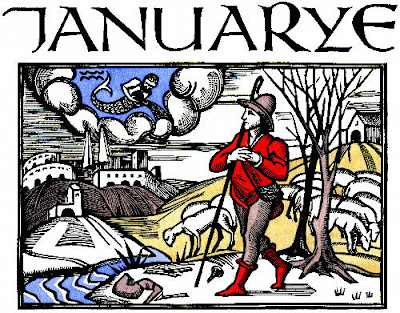 Well worth adding to your RSS feed. I am a writer and I work from home. I have a perfectly good office: it is warm, quiet, with a view of the street so why should I need somewhere else? The problem with my office is it is too well-connected. It has a phone and I love talking to people. It also has broadband. Blogging, twittering, emailing: I love it all - rather too much. I needed to escape. I needed somewhere I could go to be alone with my old unconnected laptop and write. I had the idea of a shed a few years ago but I really became inspired after I interviewed Sami Rintala in Oslo about his Boxhome - a tiny space for one person. What do we really need to live? Very little it seems to me. And yet we fill houses with stuff. I was also inspired by reading about Daphne DuMaurier in Justine Picardie's novel 'Daphne'. 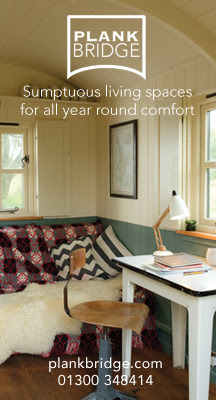 Even posh old Daphne DuMaurier worked in a shed - wrapped in blankets when it was cold - so why shouldn't I? In fact there seemed to be all sorts of famous writers who worked in sheds - Virginia Woolf, Roald Dahl, George Bernard Shaw. There was obviously an excellent precedent. So one wet day in March my husband and I toured a few garden centres. This one seemed ideal. It is 8 feet by 8 feet and it had a good thick skeleton supporting its outer cladding. We elected to have treated bearings and floor and we decided to have toughened glass in case something hit the window. There are five windows altogether, the diamond leading is standard. We stood in a Welsh garden centre and listened to rain pounding on the roof and looked around us. There is something comforting about listening to the rain in a shed. Yes, we thought. This will do. We put the shed at the side of the house which was already paved for a washing line. It is a sheltered spot and has a good view of our small garden. After it had been delivered and assembled in early in early April, we went to the DIY store for supplies: we decided on recycled polyester fleece for insulation, and fibreboard, already treated, for the lining. These were attached using brass screws and caps - attractive and functional. My husband also wired in a couple of sockets and a florescent light from an adjacent shed. The floor was varnished several times with dark oak floor varnish. I have added a mat (for added insulation), a table-like desk, a chair and a light. It works well. Not only have I already produced a chapter of a book, but I have learnt things too: birds do not sing their own songs any more, but imitate the trappings of modern life: mobile phone trills and car alarm squawks. When I sit inside I feel like I have left everything behind, and all there is left to do is write. Darts player John MaGowan (who was even on Bullseye decades ago) is enjoying what Gary Jacob in The Times rightly calls an Indian Summer: the 67-year-old recently marked up a recordbeating nine dart finish and just before Christmas won his first round match in the PDC World Championship. And what has been behind this resurgence? "I've been practising hard," he told reporters. "I've been in my shed since I qualified and it's sharpened me up." Good man. 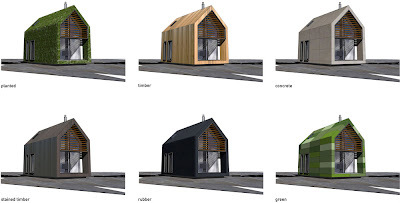 The BrightBuilt Barn is a very interesting exercise in the future of shedworking, combining as it does a studio space with the potential to turn it into something more residential. Essentially, it's a very eco-friendly build (selfsufficient for heat and energy, excellent insulation, and so on - more on this at the excellent Electronic House site) built by Kaplan Thompson for owners Keith and Mary Collins who intend to use it as an art studio, workshop for metals and electronics and office space. 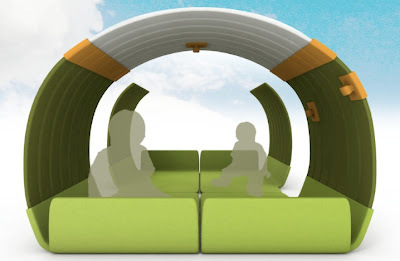 Its moveable partitions also mean it can be fiddled with to turn it into a house with a couple of bedrooms. It's a fascinating project which you can follow at its blog and wiki. Apologies for the delay in posting this final hut in the beach hut advent calendar but it's worth the wait. This last hut attracted a crowd of hundreds to celebrate the theme of wise men (there were three sets including some on stilts) and their gifts inside a golden hut, frankincense being burned outside and the chance of being anointed with myrrh (how often does that happen in your shed?). Large Shedworking congratulations to all involved in this uniquely creative project over the past month. Shutters open again on December 29. "Tomorrow is our final day as it is Christmas Eve and should be quite a special evening at hut 395 including a chance to receive a Christmas blessing. 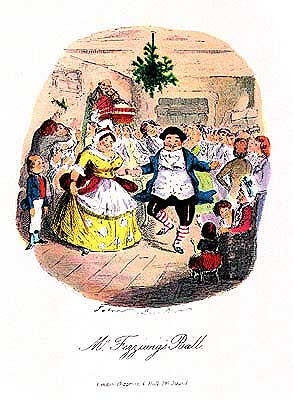 A number of the huts will also open at 3.30pm on Boxing Day for a little recap for those who might not have been able to get to one of the evenings or who are visiting Brighton & Hove for Christmas." As we enter the final straight on this marvellous project from BEYOND, the latest hut had as its theme Gentle Mary Laid Her Child (sung to the tune of Good King Wenceslas). 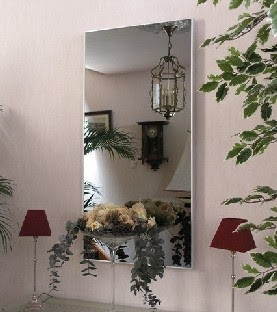 The infrared heating panel from Multiheat is a simple, distinctive rectangle of glass, in either sensory textured or highly polished black or white colour with a small silver coloured frame all at only 3.5cm deep, made to high quality and specifications. All panels are supplied as a simple plug in but can also be wired into a standard electrical circuit and fitted into the ceiling for a sleek contemporary image, sensors and a room thermostat and timer can also be fitted to provide complete heating control. There's more detail about how it works here. BEYOND's beach hut advent calendar is really making waves: the latest hut was visited (unannounced) by the Mayor of Brighton & Hove. Also on show were paintings depicting the adoration as well as a painting of the local beach huts. Next hut, 382. 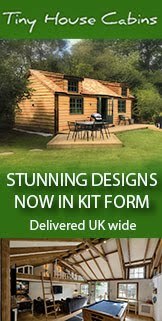 Tumbleweed Tiny Houses UK tour: can you help? 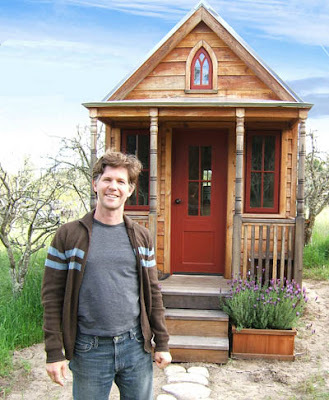 As we reported earlier in the month, Jay Schafer of Tumbleweed Tiny House (pictured) is coming to the UK in September to give several workshops on the practicalities of small living. Kent Griswold from Tiny House Blog is helping to organise a venue for these workshops in London (September 12 and 13) and Dublin (September 19 and 20) from 9am to 5pm. Essentially, the venue needs to have room for 25 people plus some basic amenities. 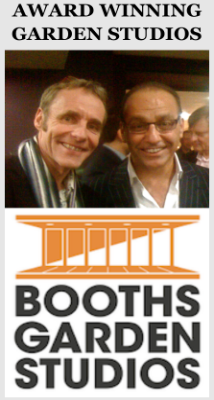 If you know of somewhere suitable - including if you yourself are in the venue business - please email Kent (or if you email me I'll be happy to pass it on or just leave a comment). Day 20's theme was The Little Drummer Boy at hut 225 and featured an informal guided percussion workshop as well as the project's first Christmas tree (complete with drum-themed decorations). Next hut, 315. More details at BEYOND. "Entrepreneurs, freelancers, consultants, and a host of other people have chosen the coffee shop as their alternative office. The objective of the project is to find out when and why this trend has developed as well as uncovering the pro’s and con’s of using the coffee shop as an alternative to the more traditional office or home office." It's part of a wider project which includes a web site, survey and book. There's also an interesting historical side to it looking at the history of coffee houses. Coffee Shop Office is run by Gregg Taylor, Lori Thiessen and Aaron Cruikshank. There was plenty to see at no. 268, day 19's hut: a giant neon cross from Brighton light artist Andy Doig of Fishtailneon.com, three totem poles (representing the three kings), a ghostly digital mirror, and a short performance by four members of local theatre company Copperdollar. Next hut, 225. 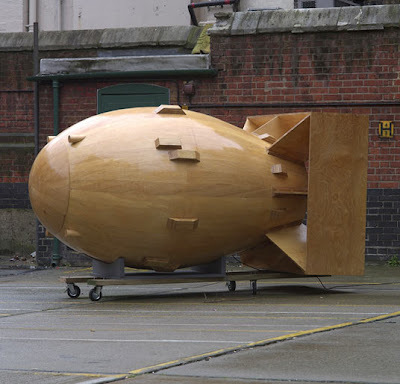 Congratulations to shedworker Clare Dudman (profiled in issue 15 of The Shed magazine earlier this year) whose book 98 Reasons For Being featured in the last episode of the present series of Jack Dee's very funny Lead Balloon. 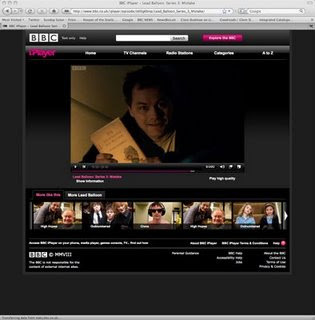 You can see the episode on the BBC's iPlayer thingy here and the book appears about 20 minutes in. You can't miss it. In a nice piece of synchronicity, the episode is all about working from home. Mr Dee was also kind enough to visit Clare's blog to congratulate her. What a nice chap. Owner of hut 315 artist Janette Tozer produced a special painting to celebrate day 18 of the beach hut advent calendar organised by BEYOND on the the theme of We Three Kings. Inspired by the profoundly influential Bauhaus school of art, everything about our new Haus+ design embraces the movement's original ethos of unifying art, craft and technology and combines it with the practicality now required for 21st Century living. The expanse of opening horizontal glass invites the garden panorama inside while brining luminescence to the spacious lifestyle interior. The Modernist look is artfully captured with the use of exposed industrial steel forming the façade. rafters and lightweight recycled slate tiles. Garden2office is also offering a free floor-to-ceiling triple glazed window, worth over £700, with all units ordered from now until February 3. If you're interested, get in touch with Mark. Most of the shedworkers I know stuff/insulate their garden offices with books. 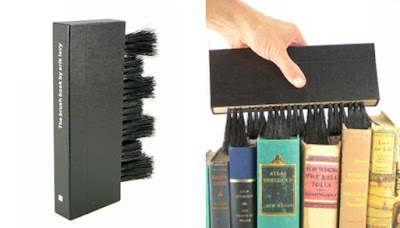 So here's something we could all do with, the Book Brush. Simply pull out the 'volume' from your shelves and dust away. Very therapeutic too when you need to relax. 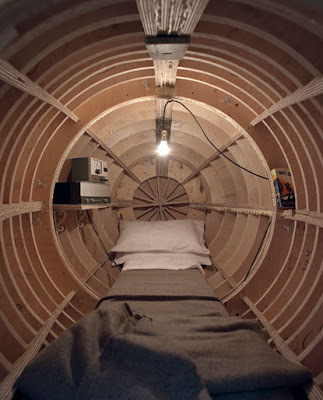 "The idea of creating such a small living environment came from the growing reports of people being forced from their homes unable to make their current mortgage payments, and turning to living with family, in garden sheds and even in cars. "The design also caters for a market that aren’t feeling such hardship, but still looking to find more space without moving house. 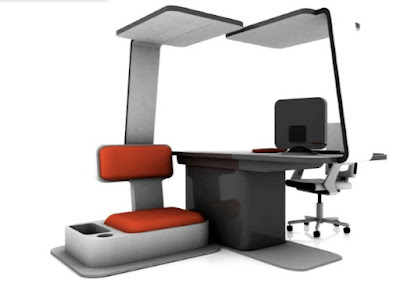 The basic shell version therefore makes an ideal home office, extended living space for a house or a children’s playroom. 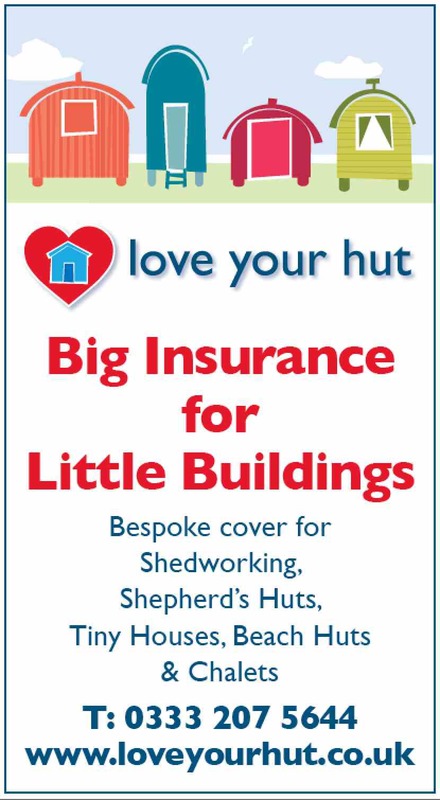 Other uses include individual low cost student or key worker accommodation, an ideal house for a first-time buyer, or even a holiday home. Developers are interested in the design to fulfill the quota of affordable housing they need to provide in a typical housing scheme. 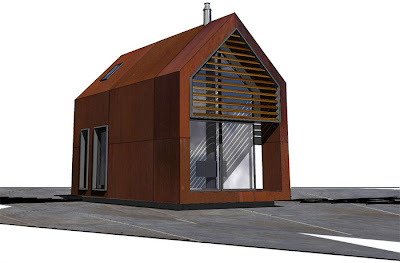 "We were keen not to compromise on space standards and quality of design to achieve a low-cost micro home. The layout of the shed is extremely efficient and compact, yet provides a spacious feeling with a double height space over the main living area. Directly over the kitchen and shower room is a double bed deck with ample storage and hanging space for clothes. To maximise storage, one of the most important attributes people look for in a home, an inner “sleeve” has been designed that incorporates cut outs for furnishings and fittings, and elsewhere provides plenty of storage space. "This inner lining also contributes to the buildings excellent thermal performance. The (FSC Certified) timber framed walls, floor and roof are insulated using cellulose fibre (extracted from 100% recycled newspapers). The windows are all double glazed, and the shed is heated by electric underfloor heating with the option of a real wood burning fireplace. 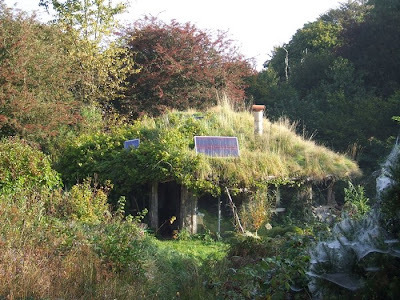 By incorporating renewable energy systems to the building (identified as optional extras), it’s possible for the shed to achieve zero-carbon status (Level 6 of the Code for Sustainable Homes). We have included the same criteria set out for our Zero Carbon house (home:works). We have also been careful to design and specify internal fittings and finishes that contribute to our own “healthy home” requisite, to improve air quality, cleanliness and health and safety. "We considered trying to classify the building as a caravan to eliminate the need for Building Regulations Approval, however, they were keen to not only provide a structure that performed no differently to a traditional house, but also met accessibility requirements for the disabled. With simple modifications to the interior and and ramped access, the shed can cater for wheelchair users. 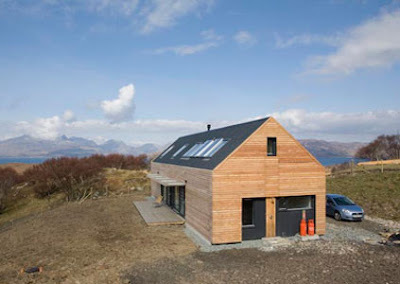 Having the same attributes of a dwelling, the shed is also VAT zero-rated. 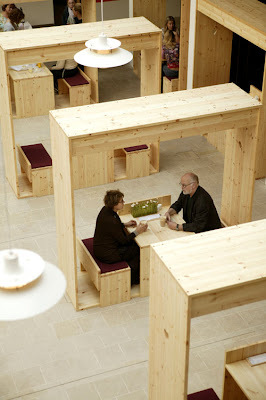 "The shed can be entirely prefabricated in a factory and delivered to site (sitting on a simple concrete foundation). 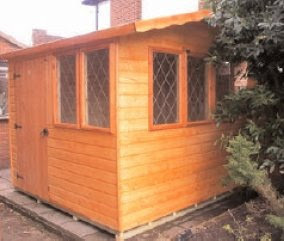 Alternatively, the components can be delivered and the shed assembled on site, with each being small and light enough for one or two people to manhandle, eliminating the need for a crane. Ideally the structure would also be delivered by Bio-Diesel haulage vehicles to maximise the sheds eco credentials. 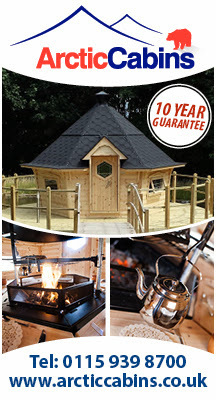 "All-in-all, the shed provides a very unique alternative living, working or playing environment, eco-friendly, healthy, low cost and easily deliverable. 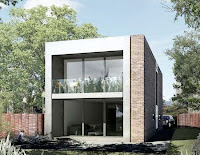 It may be designed in response to this current economic climate, but it could challenge the housing market to steer away from the bland house design that is currently on offer throughout the country." There's a documentary about the building of The Shed on December 18 (tomorrow) on the Discovery Channel and a nice piece in The Times. 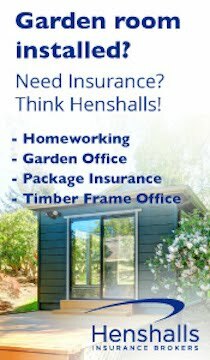 Best of all, if you want a special shedworking holiday, you can rent it out. Click here for details. Thanks to Elspeth Thompson for the alert. 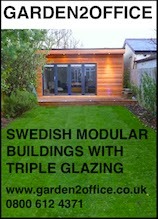 Today's posts are sponsored by garden2office, the Swedish garden office specialists.Click here for more details. 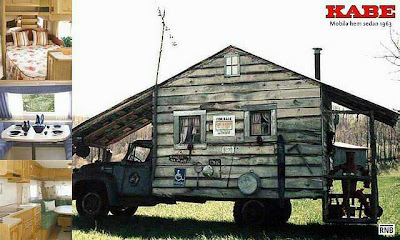 The Mobila Hem Sedan 1963 as featured on the must-read Tiny House Blog. 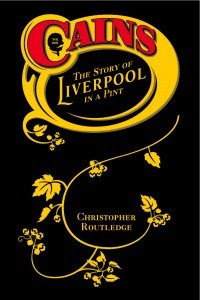 Friend of Shedworking Chris Routledge has a marvellous new book out, Cains: The Story of Liverpool in a Pint which is a history of the famous Liverpool brewery. You can buy the book here and you can listen to (or download) Chris read from the first chapter of the book (hopefully recorded in his garden office) here. 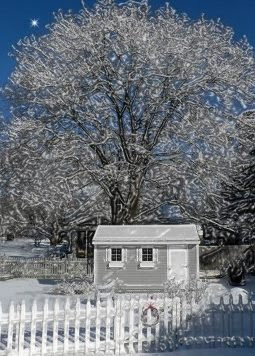 Can you guess the carol theme for day 16's hut? It's amazing the dedication shown by the beach hut owners - this one was completely redecorated just for the day. Good work. Next hut, 312. 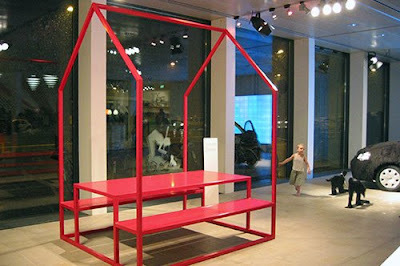 "HUS is a furniture with a roof, but not one of those that keeps the world out but one that keeps intimacy in. For all the places needing a small portion of cosyness; where you wait for the train, where you eat your lunch or drink your coffee." Again, a foodie concept which has interesting sheddish overtones. Garageworking: the next big thing?